What types of businesses hire people in engineering technologies? Companies that require engineering technicians are large and small, manufacturers, consultants, small entrepreneurial design shops, energy companies, or broadcast companies to name a few. Any company that deals with a mechanical or electrical system may have the need for an engineering technician. What skills should I have now? Hard skills like math, technology systems, CNC, or drafting can all be acquired in high school and at the community college. However, soft skills are those we develop as we mature. Skills like persistence, patience, motivation, or curiosity are extremely important in engineering technology. If you have those skills and a determination to fill in with formal education, you are a good candidate for this career field. What sorts of classes should I take in high school? Take as many math and science classes as you can, and if your school has the option for career training at the high school level, take courses that interest you in the science and technology areas. Some examples are drafting, welding, or electronics. Employers train engineering technicians to convert engineers' specifications into design models or prototypes, or to run, program, or troubleshoot sophisticated systems. To do that, technicians must understand engineering concepts of materials, electronics, and complex systems. Now add in the high rate of change in technology and your employer’s need for innovation, and you can see how this job might challenge you nearly every day. Will I be able to advance in my job? Engineering technicians who take initiative and consistently do well on the job can be advanced to supervisors, trainers, project leaders, or site managers. Since many of the credits in the engineering technology Associate in Science degree program will transfer, you could earn a bachelor’s in science for further advancement. The National Association of Manufacturers says there will be a possible shortage of as many as 12 million skilled workers in the next two decades. The key word is “skilled.” Many apply for jobs with manufacturers, but few have the right skills. A good way to make sure your resume goes to the top of the pile is to get the right training, such as the engineering technology programs at Black Hawk College. Is this career field a good place for women? Engineering technology is a good place for young men or women. Thoroughness, reliability, creativity, teamwork and initiative are not just traits for men. If you enjoy learning how things work and how they can be reduced into basic elements, you can make a contribution in this field. And you know you’ll be receiving good pay and benefits, working in industries that set those standards for all American workers. 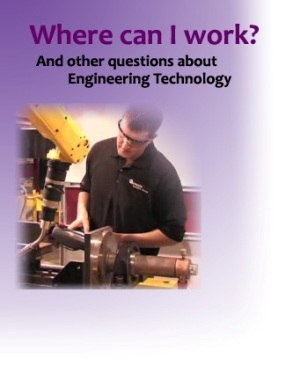 Will I mostly take instructions from others as an engineering technician? Engineering technicians work with engineers and managers to get the job done, but you shouldn’t look at it as “taking instructions.” You will be part of a team, and you will have a very important job to do. You’ll be treated with respect and have the opportunity to make your own contribution. You may oversee others who have been assigned to help you do your job. If you have read the engineering technician job descriptions, you’ll see lots of variety. Some of the areas include: making and analyzing prototypes, product testing, machine troubleshooting, installation or repair, analyzing the assembly process, making reports, supervising, helping your employer plan or designing material for sales presentations. Variety also comes in the form of regular new project assignments. Will the pay be good? Salaries vary according to experience and the region of the country in which you decide to work. Salaries are higher where the cost of living is higher, but generally, you can expect a salary comparable to levels posted on the US Bureau of Labor’s Occupational Outlook Handbook’s Web site: $31,800 to $54,700 annually nationwide. In the Quad Cities area (northwest Illinois), Black Hawk College graduates are reporting incomes averaging about $20.00 per hour or $40,000 annually with some graduates earning as high as $64,000 a year. What if I want to go back to school later? If you are a Black Hawk College graduate, many of the courses you have already taken may transfer to a four-year college or university. Any sophomore or lower courses that you still need to satisfy transfer requirements can be taken at the community college’s lower tuition and transferred in to the four-year degree program. Advisors at any college can help you determine what you need to continue your education. My math isn’t that good; should I think of another career? Remember two things: math can be learned, and people with other talents and a strong work ethic are valuable employees. As stated before on this Web site, once you enter community college classes, you will learn the math as it applies to your future work. Math applied to the specific situation usually makes more sense to those who may struggle with it.